Responding to a series of hit pieces by self-declared “media watchdog” website Media Matters, a public advocacy group representing 9/11 family members has demanded an apology. NYCCAN, the group responsible for airing ads urging an investigation into the destruction of World Trade Center Building 7, has issued a statement applauding FOX News hosts Andrew Napolitano and Geraldo Rivera for their fair treatment of the subject and rebuking Media Matters and The Huffington Post for their biased coverage. We who lost loved ones on that day cannot stand idly by as our honest search for the truth about their death is trampled upon. 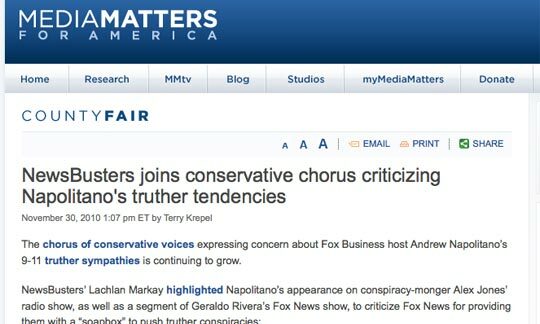 We demand that Media Matters apologize for its unfair, irresponsible and injurious coverage of this deeply sensitive issue. Media Matters, which claims to “monitor, analyze and correct” right wing “misinformation” in the US media, has regularly portrayed 9/11 truth as a right-wing extremist cause. Media Matters is the recent recipient of a one million dollar donation from financier George Soros. Bolling: "Your BS is hurtful to those of us who lost loved ones"
Good on NYCCAN for calling them out. Good! — Good. Right on. Media Matter is scum – self-appointed liars in chief.